Selected papers. High-resolution electron microscopy, neutron diffraction with isotopic substitution and x-ray absorption fine structure for the characterisation of active sites in oxide catalysts (John Meurig Thomas). Location of Bronsted and cation sites in dehydrated zeolites: a comparison (A. Alberti et al.). Characteristics in the photocatalytic reactivity of the tetrahedrally coordinated ti-oxide species designed within various types of zeolites and on support surfaces (M.Anpo et al.). Chemisorption and catalytic properties of gold nanoparticles on different oxides: electronic or structural effects? (F. Boccuzzi, A.Chiorino). The vibrational spectra of phosphorous oxynitride at high pressures (M. Capecchi et al.). Dissociative adsorption of H2 on defect sites of MgO: A combined IR spectroscopic and quantum chemical study (M. Cavalleri et al.). Modification of redox and catalytic properties of Kegging-type, Sb-doped P/Mo polyoxometalates in the selective oxidation of isobutane to methacrylic acid: control of preparation conditions (F. Cavani et al.). Surface properties of mesoporous Ti-MCM-48 and their modifications produced by silylation (V. Dellarocca et al.). Computer simulations of ethane sorbed in an aluminophosphate molecular sieve (P. Demontis et al.). Intracage chemistry: nitrite to nitrate oxidation via molecular oxygen. A car parrinello study. (E. Fois et al.). Synthesis, spectroscopic and catalytic properties of cobalt and copper ions in aluminophosphates with chabasite-like structure. Studies of the NO reactivity (A. Frache et al.). Local structures of active sites on Mo-MCM-41 mesoporous molecular sieves and their photocatalytic reactivity for the decomposition of NOx (I. Higashimoto et al.). The factorial experimental design applied to the zeolite synthesis (A. Katovic et al.). Synthesis and characterization of dye-containing MCM-41 materials (B. Onida et al.). Modeling of breakthrough curves in fixed-bed zeolite columns (F. Pepe et al.). A kinetic study of NO decomposition on Cu-ZSM5 (R. Pirone et al.). The reductive activation of molecular nitrogen on"electron-rich" MgO: details on the structure of the adsorption site via the N2-OH superhyperfine interaction (Z. Sojka et al.). 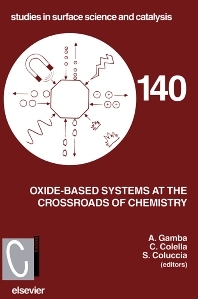 This volume includes papers presented at the second International Workshop on Oxide-based Systems at the Crossroads of Chemistry, held at Villa Olmo in Como, Italy, 8-11 October. The selected papers present the highlights of recent research in the field of oxide structure. A wide range of oxidic materials, including real oxides, zeolites and layer-structured systems, is considered and described in terms of preparation methods, structural characterization and the relation between active sites, structure and catalytic properties. The application of the most powerful simulation and physical-chemical techniques show their usefulness in discovering and explaining structural and dynamic properties of complex materials. Moreover the development of sophisticated spectroscopical and analytical techniques are shown to significantly improve the growth of surface oxide science, generating new tools for the knowledge of catalyst structure and reaction mechanisms. An interesting feature is the inclusion of papers which show the mutual roles of experiment and theoretical models. For chemical, physical, engineering institutes and departments of universities, libraries and industries.